Which state capitals have the highest standard of living? For many people, the answer to that question is a matter of opinion that depends on what’s most important to them. If you can’t decide whether you prefer Boston over Albany or Atlanta over Austin, we’ve got a solution to your dilemma. SmartAsset took an objective, data-focused approach to comparing the best state capitals in America. 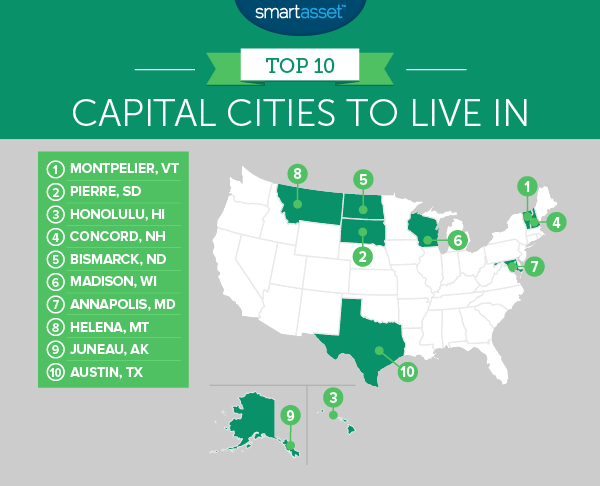 This is SmartAsset’s third annual study of the best state capitals to live in. Check out the 2015 ranking here. Double take. The top three best state capitals to live in were also the top three state capitals in our 2015 analysis. Southern capitals don’t rank well. Out of the five worst state capitals in the country, four of them are located in Southern states. Compared to the top ranking state capitals, the average resident living in these cities has less disposable income and faces higher unemployment rates. Montpelier ranks as the best state capital to live in, according to our 2015 and 2016 analyses. Like last year, it has the highest concentration of dining and entertainment-related businesses per 10,000 people. Plus, Montpelier still has one of the lowest violent crime rates, with just 142 violent crimes reported per 100,000 residents. If you’re looking for things to do in this small city, you can check out the North Branch Vineyards or the Lost Nation Theater, which has won numerous awards in recent years. And while there are restaurants in Montpelier, one thing you won’t find is a McDonald’s. In fact, it’s the only state capital where you won’t see any golden arches. Pierre ranks as the second best U.S. state capital for the third year in a row. Over the years, its unemployment rate has fallen. At 2.2%, Pierre’s unemployment rate is now the lowest rate among state capitals. South Dakota has one of the strongest economies in the country. Some of its major industries include agriculture, fishing and hunting. While it’s generally considered to be a great place to visit, Honolulu could also be a good place to live. Dealing with its high cost of living might even be worth it, especially if you’re interested in moving somewhere that’s warm and culturally diverse. There are other things to do in Honolulu besides going to luaus and swimming in the ocean. The tropical island has many parks, hiking trails and historic sites. For every 10,000 residents, there are about 21 dining and entertainment establishments. Concord has the second lowest unemployment rate in our study. According to data from the Bureau of Labor Statistics, only 2.4% of its population was actively looking for work between May 2015 and June 2016. Some of its top employers are Liberty Mutual and the University System of New Hampshire, which includes schools like Granite State College. Bismarck is one of the safest state capitals in the U.S. Compared to the other capital cities, Bismarck has the fifth lowest violent crime rate and the sixth lowest property crime rate. And anyone looking to buy a home in this city should know that its housing market ranks fourth in terms of growth and stability. Madison is a familiar city on our list of the best state capitals to live in. It ranked seventh in our 2015 analysis and third in the first edition of our study. Mad City also ranked fourth in our recent study of the least-stressed cities in America. Why are people in Madison so relaxed? For one, perhaps they’re content with the fact that the city’s unemployment rate has fallen. Since we conducted our 2015 analysis, it has fallen by about 3%. The capital city of Maryland has a firm place in our nation’s history. The Maryland State House, which is located in Annapolis, is the oldest state capitol that’s still in use today. The city is also known for having the first theater in the Americas. Living in Annapolis is generally more affordable than living in Washington D.C. Residents in Annapolis spend about 25.1% of their income on housing costs, leaving them with $56,420, on average, to spend on other expenses. In our 2016 study of the best states for homeowners, Montana ranked eighth. There are multiple reasons why that’s the case. One is that folks with homes in the Treasure State have relatively low property tax rates. On average, homeowners and renters in Helena spend $9,336 on housing-related costs each year. That means that in terms of the state capitals with the lowest annual housing expenses, Helena ranks ninth. Juneau, a city in the southeastern portion of Alaska, is surrounded by mountains and glaciers. It has a population of just 32,200 people. Nine times as many people live in Anchorage, Alaska, which is located about 574 miles away. The city of Juneau once had some of the largest gold mines in the world. Today, the capital has a lot to offer its residents. Our analysis reveals that it has the fourth highest concentration of dining and entertainment businesses per 10,000 people. Austin is one of the three cities in our top 10 list with a larger unemployment rate than it had last year. At the same time, the average resident has a bit more disposable income than they had in 2015. Since then, the median household income has increased by 2.3%. To create our ranking of the best state capitals to live in, we focused on five factors, including the unemployment rate, the violent crime rate (violent crimes per 100,000 residents) and the property crime rate (property crimes per 100,000 residents) in each city. We also collected data on the number of dining and entertainment establishments per 10,000 residents, including bars, restaurants, theaters and bowling alleys. Finally, we calculated the average amount of disposable income that residents have in each city by subtracting median annual housing costs from the median household income. After pulling our data, we ranked all 51 cities in our study across each of our metrics. Then, we averaged those rankings and gave each city a score. Since none of the cities ranked first in all five categories, the best state capital scored a 95.35. The state capital that ranked last scored a 17.45. Note that we created a single ranking to measure the overall crime rate in each city by giving 70% weight to violent crime and 30% weight to property crime. We gave full weight to the other three factors in our analysis. Data on unemployment rates comes from the Bureau of Labor Statistics. Violent crime and property crime data comes from the FBI’s Uniform Crime Reporting database and takes local crime reports into account. Data related to cost of living (including median household income and median annual housing costs) and dining and entertainment establishments comes from the U.S. Census Bureau.